The Proper Way Underwater Services, Inc. is the premier hull cleaning company in Palm Beach County! Established in 2002, we quickly rose above our competitors because of our rigid commitment to quality, on time service, and our attention to detail. We are fully licensed and fully insured. Our range of services is broad and our prices are fair. We have the experience and equipment to handle all of you underwater needs! The Proper Way strives to provide you with a personalized and professional service that the others just can’t seem to duplicate. Check out our site and see which one of our service plans is right for you. 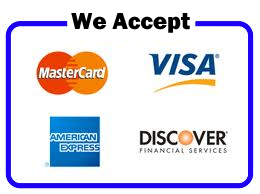 For your convenience we accept all forms of payment including all major credit cards, and even have an online payment option! Edward Struzenberg (Owner/Diver) – Ed was born in Florida, and has been diving in the areas around Jupiter most of his life. He was certified to dive in 1990, and started commercial diving in 1994. He spent a number of years as a commercial hard hat diver for companies like Perini Marine, and Ocean Breeze Construction. There he learned the skills for diving in low visibility environments. Ed started cleaning yachts in 1997, and has been doing it in the area ever since. Ed has OVER 10,000 documented hull cleanings, and he brings that knowledge and experience with him under every vessel! Michelle Struzenberg (Office Manager) – Michelle’s friendly voice is the one you will hear when you call. She can answer all your questions, schedule appointments, and set up new accounts.